Happy Monday, everyone! No, not so happy? Well, we’d like to brighten your day a little with our first entry in our SGL logo redesign contest! This submission comes from Moriah Joelle in Metro Detroit. About the designer: My name is Moriah Joelle and I am a local Graphic Designer with an associates from The Art Institute of Michigan, Novi. With over 5 years experience and multiple clients as well as creating handmade books, puzzles, holiday cards, etc., I am certainly a jack of all trades in the design world. About the submission: For my logo creation, I wanted to capture the essence of SoupGrant Lansing. 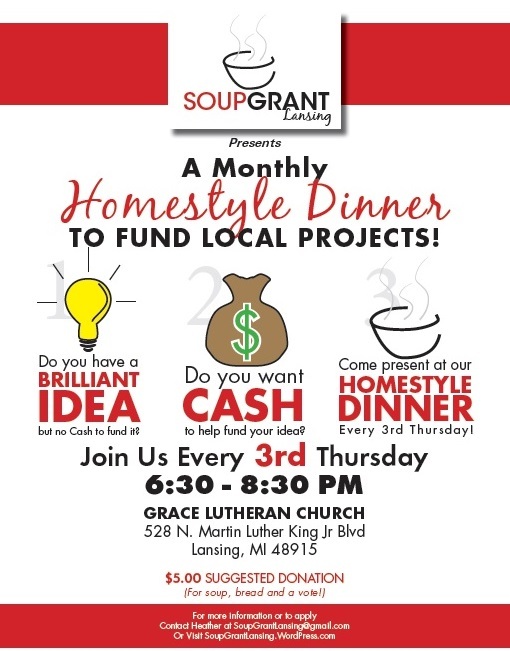 Something simple, that has a clear message to help explain the great cause that SoupGrant Lansing is all about. For the poster creation, I wanted to still have the personal touch of the original. Handwritten with graphics to grab the attention of the viewers, so I went with a series of 3 images and nice eye catching fonts. If you’d like to connect with Moriah, check out her website which shows off a lot more work that she’s done! Like what you see? Come out and support Moriah on the 20th!